(0 Customer Reviews) | Write Review 4 issues per year Wakeboarding is a sport, a passion, a community - a life. And, Union U.S Wakeboarder Magazine is committed to those who call wakeboarding ‘theirs’ by reflecting and portraying the sport in a modern light. A true ‘riders’ magazine in every sense, focusing on the nature and culture of, wakeboarding as a professional lifestyle. Having seen the sport, move from its impressionable beginnings through to having a strong enough identity to stand alongside its established, boardsport cousins; surfing, snowboarding and skateboarding. Differentiating itself from its Australian brother, Union U.S Wakeboarder features coverage on a global scale. 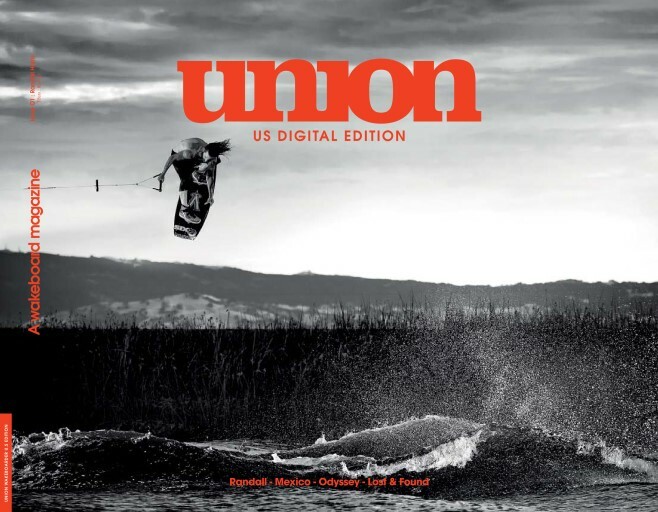 Reshaped and redesigned specifically for the digital medium, Union U.S is more than a Wakeboard Magazine, it’s a Digital Wakeboard Magazine. Download your exciting digital edition now to never miss an issue. Download the FREE Digital Sample that we put together just for you. The complete Union U.S Issue 01 features Randall Harris interview, Mexico Journey, Justin Stephens interview on what happened to the respected ‘Company Wakeboards’, Interview with Mitch Langfield on his first full length ‘Odyssey’ as well as interviews with Josh Twelker, Danny Hampson, Danny Harf, Cody Hesse, Derek Muscat, Trever Maur and more - it also features exclusive videos, teasers and general ironic awesome-ness that we are known for. So, have a read of this free sample then Subscribe to Union Digital for real and have the world’s most progressive wakeboard publication with you everywhere you go. Find out why JD Webb says “I’m ready to get out there. So sick. We showed up in the middle of the night [and] you really can’t see how beautiful this place is at night. Now the sun’s starting to pop, we’re here, and the water’s like 80 degrees and blue. You can see the bottom for days. I think we’re in paradise” or why Mitch Langfield says “I started shooting on our Europe trip last year around June. I traded up from the Canon 7d to the 5d after winning BoardStock in Oz. And then I just started filming everything.” Or why Justin Stephens says It took me years before I could even start the process of forgiving myself for allowing things to continue as long as they did and hurting people as a result, including my own family.” Subscribe today. Wakeboarding is a sport, a passion, a community - a life. And, Union U.S Wakeboarder Magazine is committed to those who call wakeboarding ‘theirs’ by reflecting and portraying the sport in a modern light. A true ‘riders’ magazine in every sense, focusing on the nature and culture of, wakeboarding as a professional lifestyle. Having seen the sport, move from its impressionable beginnings through to having a strong enough identity to stand alongside its established, boardsport cousins; surfing, snowboarding and skateboarding. You'll receive 4 issues during a 1 year Union Wakeboarder magazine subscription. You'll receive 4 issues during a 1 year Union Wakeboarder magazine print subscription.